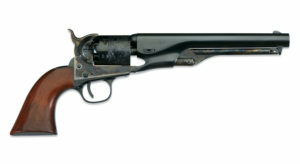 Samuel Colt began production of a revolving-cylinder pistol on the day the Alamo fell in 1836. 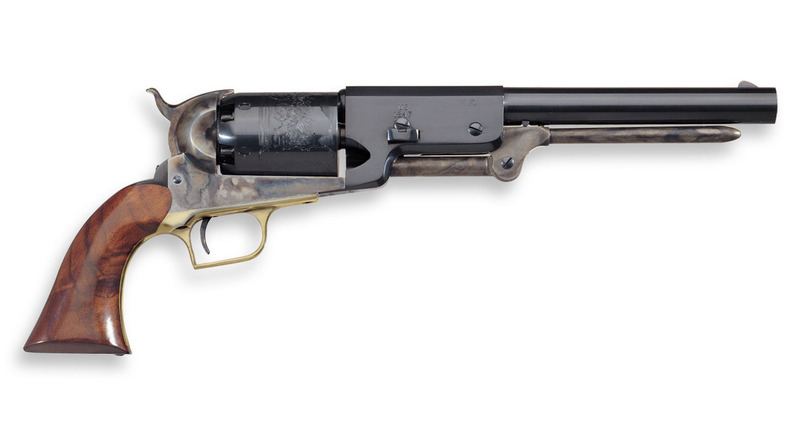 Produced at his factory in Paterson New Jersey Colt’s new pistol was enthusiastically received by the Rangers of the newly independent Republic of Texas and in 1844 Colt’s pistol made history when sixteen Rangers held off 80 Comanche warriors with their new revolvers. Former Texas Ranger Sam Walker had been in the Comanche fight in 1844 and became a firm believer in Colt’s pistols. In 1846 war with Mexico was looming and Walker’s U.S. Mounted Rifles needed a powerful handgun for mounted combat. Colt built a revolver for them that held 58 grains of black powder and chambered six .44 caliber balls. Sam Walker ordered 1 000 of them and rode off to Mexico. The Walker’s massive fire-power needed a much stronger frame and larger overall gun design than earlier models the Walker weighed nearly four-and-a-half pounds and was 15¾” long. The Walker’s reputation assured Colt’s future success.